I’m off to take part in the Florestan Festival at Peasmarsh for the next few days. 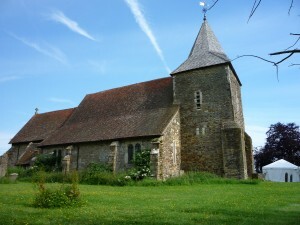 The festival takes place in a lovely little Norman church in the middle of the East Sussex fields (see photo). This year’s festival, the 13th Florestan Festival, celebrates the work of Robert Schumann whose 200th birthday was on 8th June. Schumann has always had a special meaning for us because our trio is called after one of his imaginary characters, the Florestan who symbolised his active, energetic side. We’re playing all Schumann’s piano trios, and I’m also playing his wonderful ‘Davidsbuendler’ for solo piano. Robert Philip will be giving a talk on Sunday afternoon about Schumann’s struggle to ‘let both man and musician speak at once’ in his music. These are just a few of the events on offer during the festival, which also features the London Haydn Quartet, the cellists Jonathan Manson and Sally Pendlebury, and educational events provided by the Lawson Trio and by Sam Glazer. Normal service on this blog will be resumed next week. This entry was posted on Wednesday 9th June 2010 at 10:00am	and is filed under Concerts, Florestan Trio. You can leave a response, or trackback from your own site.